Rikyu, who had moved to Kyoto from Sakai, is said to have built a four-and-a-half mat tea room in his residence across from the main gate of Daitoku-ji temple, and put up a name board saying Fushin'an. Finally he also built a residence below the castle at Jurakudai. This was near Yoshiyamachi Motoseigan-ji. In this residence there were two shoin-style rooms, a cypress shoin, and a coloured nine mat shoin, a four-and-a-half mat tea room and a two mat tea room. Rikyu attracted attention when he at first built a one-and-a-half mat room. However, Hideyoshi said that he did not like this kind of room so Rikyu changed it into a two mat room. In Tensho 16 (1588) the farewell tea gathering for Kokei Osho who was being exiled to Kyushu by Toyotomi Hideyoshi, was given in the four-and-a-half mat room at Jurakudai. Rikyu also invited Kamiya Sotan for a tea gathering using a daisu (formal utensil stand) in the cypress shoin. 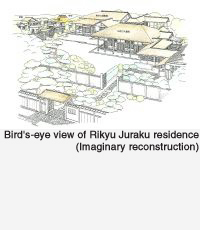 Rikyu's residence within the mansion below the castle apparently drew people's gaze. It was not what you would expect to see in a temple or a samurai dwelling. The slope of the roof was not steep or gentle, the building was not high or low. It was an inexpressibly modest dwelling. This was perhaps because Rikyu put the spirit of chanoyu not just into the tea room but into the design of the dwelling as a whole. On February 28 of Tensho 19 (1591), Rikyu committed ritual suicide in this residence.